Monday October 9 [1969?] I went over to look at "The Ayers" property again in the forenoon and visited with the folks till the 4.07 I had a nice trip home arriving at midnight. 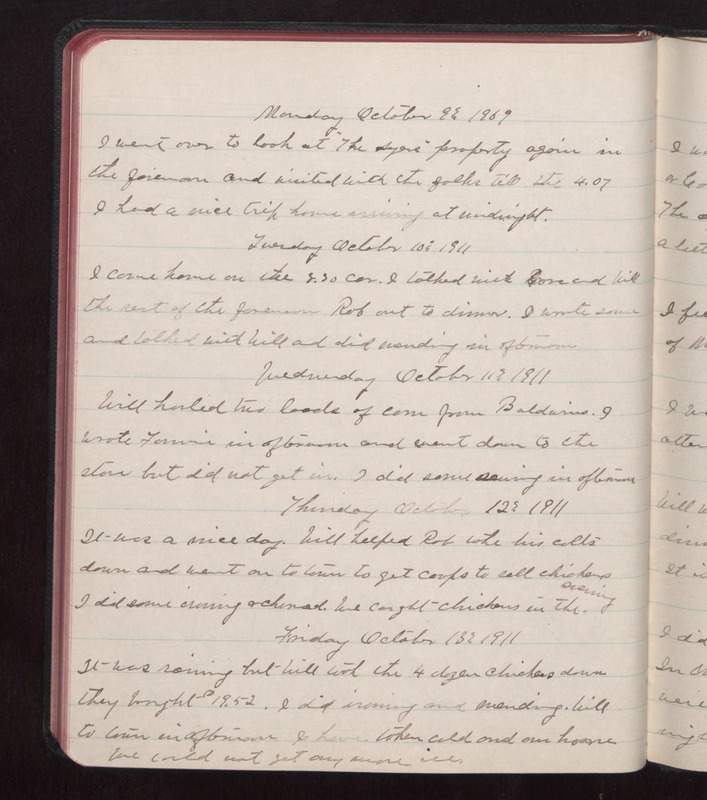 Tuesday October 10 1911 I came home on the 8.30 car. I talked with Cora and Will the rest of the forenoon. Rob out to dinner. I wrote some and talked with Will and did mending in afternoon. Wednesday October 11 1911 Will hauled two loads of corn from Baldwins. I wrote Fannie in afternoon and went down to the store but did not get in. I did some sewing in afternoon. Thursday October 12 1911 It was a nice day. Will helped Rob take his colts down and went on to town to get coops to sell chickens I did some ironing & churned. We caught chickens in the evening. Friday October 13 1911 It was raining but Will took the 4 dozen chickens down they brought $19.52. I did ironing and mending. Will to town in afternoon. I have taken cold and am home We could not get any more ice.